A celebrated conductor returns to the School of Music to inspire the newest crop of Iowa musicians. PHOTO: Miranda Meyer Ann Howard Jones serves as guest conductor for the UI's Kantorei choral ensemble and the University Choir on March 8 in Voxman Music Building. From Boston to Brazil, Ann Howard Jones has guided generations of budding musicians who, like her, have gone on to reach some of the world's biggest stages. Now in retirement, the influential conductor continues to inspire students, particularly in her home state of Iowa. PHOTO: Miranda Meyer Ann Howard Jones leads the UI's Kantorei choral ensemble and the University Choir on March 8 in Voxman Music Building. One of the conducting world's most admired educators, Jones (64BM, 66MA, 84DMA) returned to the University of Iowa last month as a College of Liberal Arts and Sciences alumni fellow. Jones served as guest conductor in a rousing performance by the UI's Kantorei choral ensemble and the University Choir in Voxman Music Building, where she shared the baton with UI director of choral activities Timothy Stalter. During her visit, Jones also hosted a film screening of Robert Shaw: Man of Many Voices, a documentary about her former mentor, and spent time with School of Music students in the classroom. Jones made a name for herself as assistant conductor to the famed Robert Shaw with the Atlanta Symphony from 1984 to 1998 and served as director of choral activities at Boston University for 23 years. Her résumé also includes a Fulbright professorship in Brazil and numerous honors from the nation's leading choral organizations. Since retiring from Boston University in 2016, Jones has served as a visiting professor at colleges around the country. 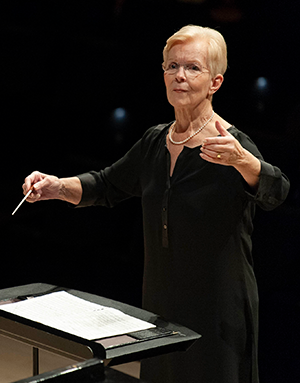 A native of the small northeast Iowa town of Cresco, Jones was often the only woman in her conducting classes when she came to the UI in the 1960s. A female conductor from the Midwest didn't exactly have an inside track to Carnegie Hall, but Jones had a couple advantages: her world-class education from the UI and a fearless will to succeed. Now, she's giving back to her alma mater. Jones recently established the Ann Howard Jones Vocal Ensemble Residency Program, which brings a group of professional singers to the UI each fall to perform and teach. The program debuted last year with a residency by Lorelei Ensemble, an all-female group from Boston. Jones is also in the process of donating her extensive collection of music, books, and memorabilia to the UI Rita Benton Music Library. Iowa Magazine sat down with Jones during her recent visit to Voxman. Here's our conversation, edited for length and clarity. You retired a few years ago, but it doesn't sound like you've slowed down much. You think, "What if the phone doesn't ring ever again? What will I do with myself?" But somehow I'm saying no to more things than I can say yes to. I've had the opportunity to go a lot of different places, which has been very interesting. Sometimes I'm teaching a conducting class, sometimes I'm teaching individual students, sometimes I'm supervising recitals. What I like is the challenge of figuring out what the situation needs that I can provide—what the student needs that I can help with. And I get to see what's going on in my field all over the country. How did the new residency you're sponsoring at the UI take shape? I've had this idea for a long time that it would be wonderful to bring excellent vocal chamber music to the students because of the outstanding vocal talent here in Iowa. It gives students an opportunity to see that it's possible to have a career as a singer in a small ensemble. You don't have to be a music teacher or an opera star—although you can be. But this is another opportunity. The residency is not just a performance, it's also master classes and lectures. In the case of Lorelei, the leader gave a lecture on women's choral music to students in the graduate conducting program. The interchange with students and faculty is a very important part of this. When you were starting out, were there many opportunities for female conductors? Let's put it this way, when I was here in graduate school, I took a class in orchestral conducting with Professor James Dixon (52BM, 56MA), who led the orchestra here for years. I was the only woman. And in the choral conducting classes, there were only two of us. We recently had a national conference in my field in Kansas City, and I would say there's an increasing presence of women, although not so many at the highest levels. We used to be able to count on one hand the number of people who were the directors of choral activities at big, doctoral degree-granting institutions. There might be 10 now. But women are at least in the mix. Do you have a favorite memory performing with Robert Shaw and the Atlanta Symphony? The whole chorus and orchestra from Atlanta once went to East Berlin to sing in the Schauspielhaus before the wall came down. That's nine busloads of Americans crossing Checkpoint Charlie. That concert was a stunner. We did Beethoven's Ninth. When we got to "Freunde" (friend) and "Brüder" (brother), people were weeping at the concept of brotherhood and peace when, here they were, so shackled. When someone comes and brings that message through great art, it's powerful. It's a phenomenon that no matter what the context, art will always prevail. How did your training at the UI set the stage for your career? First of all, the instruction here was superb. I had great voice teaching, every type of literature imaginable, and great conducting classes. 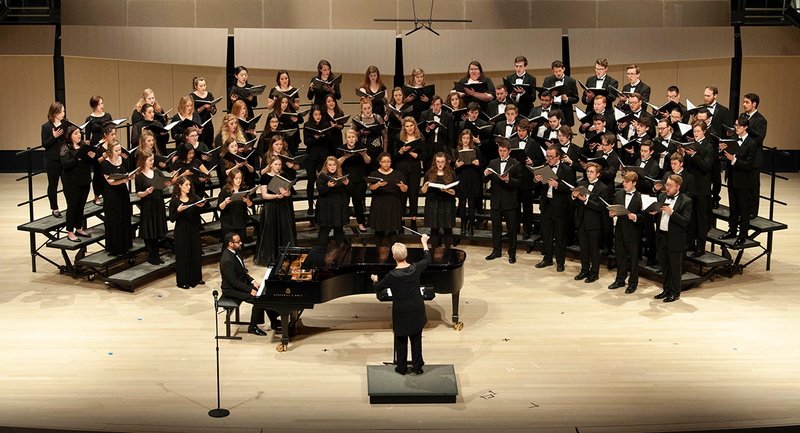 The University of Iowa's program in choral conducting was one of the first three in the country. The first was in Southern California, the second was in Illinois, and the third was here. So Iowa has been a leader in this field forever. We had students from all over the world, and there was something about the reach of this institution that was extremely important to me. We never did anything casually, and maybe that's the Iowa way—we're very serious about what we do here, and that carried over to music performance, certainly. How did you get involved with music as a kid? I grew up in Cresco, Iowa. A little over 3,000 people. It's a little place, but in that crazy town, there were four navy admirals, the first stewardess ever, two Olympic wrestlers, and about 10 wrestling national champions. The crowning glory is our Nobel Peace Prize winner, Norman Borlaug. This is a sensational little place where the groundwork was laid for me and many others that you just don't go through life and not strive. Everybody did music and everybody did athletics, because if you didn't do it, the activity couldn't exist because there were so few of us. We all acted in the plays, sang, wrote for the newspaper, and played in the band. And it was all at a really high level for such a small school. Can you tell me about the collection you're donating to the School of Music's library? I have a library full of books and scores and CDs that I thought I could just parcel out to my students. But then I thought there might be value in showing a doctoral student what a working musician's library looks like. The librarian at Iowa said, "We'll take everything you've got." One of the things going to the library is a collections of scores with Robert Shaw's markings, which is valuable to people who want to know his thinking. He was the leader in our profession through the entire last half of the 20th century. My collection isn't enormously valuable, but it makes me feel good to not throw it away. Why is it important for you to support the UI? In these days of such destructive attitudes and behavior, if we don't keep shoring up our wonderful institutions of learning, I don't know where we'll be. I've always been a big supporter of education at the highest possible level. The life of the mind has always been so important to me, and institutions like this one must stay strong. I don't know what you do in a state like this where the regents have less and less money, and the president of this university said there's not too much new money that's coming into the institution, so most of what we do that's innovative will be philanthropic. That clicked with me, and I thought, "I can't do much but I can do a little." I'll be behind this institution forever. Now that you're retired, how would you like to be remembered? You get to be a certain age, and you wonder, what's my legacy? It's not so much that my legacy is important, but you'd like to think you've lived a hardworking life and you've had something of value to give. I ran a doctoral program at Boston University for 23 years, and the number of students who came through there and have now found themselves in positions of leadership at colleges and universities around the country is astounding. I try to go to as many concerts as I can to check up on them. When I think about all the places I've been able to go because of my career—South Korea, Australia, Europe, Brazil—it's unbelievable. I came from the dinky town of Cresco, Iowa. I was just never satisfied to do the ordinary. Support the UI School of Music.